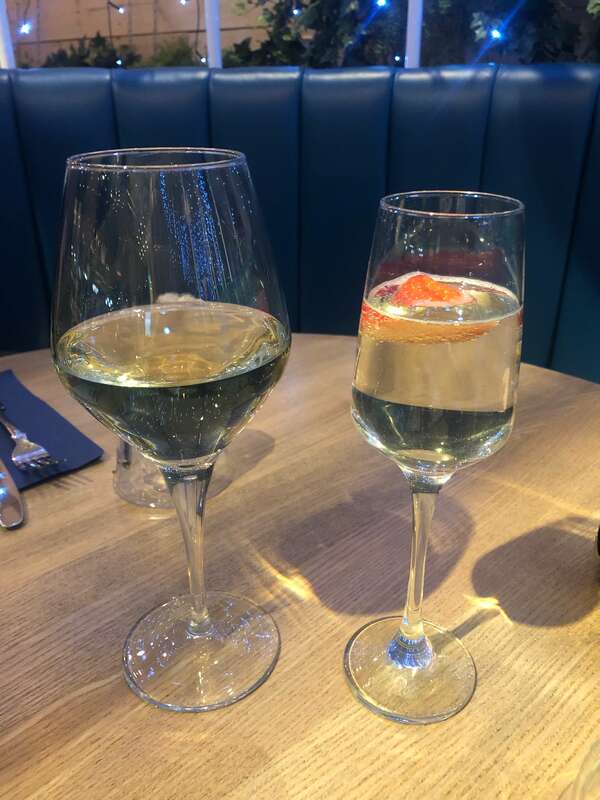 I visited The Yard, Derby back in December to try their Sunday roast menu and loved it so I was really excited when I was invited back again to try their new spring menu. This year I decided to do veganuary and so I couldn’t wait to see what vegan options The Yard offered. The Yard is an all-day restaurant and bar that is situated at (the mighty) Derby County’s Pride Park Stadium. I’ve actually been in a few times since my last review for a match-day pint. 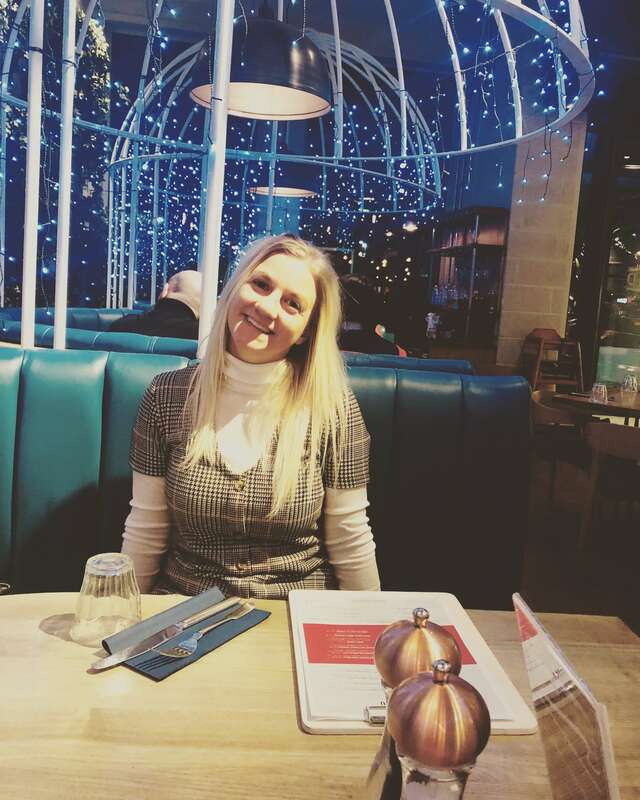 This time I invited my mum to come along (non-vegan!) as she came with me on my last visit to The Yard and we enjoyed it so much. When we arrived we were show to a birdcage booth which I’m starting to think of as our regular table as we sat in the same place last time too. I really love these booths – they’re comfy and feel sort of private. For starters I chose the Thai vegetable broth and my mum went for the duck pate lollipops. I was warned on ordering that mine was quite spicy and the waitress was not wrong – it was super spicy (which I love!) and full of flavour. The thin soup was packed full of vegetables and crispy noodles. Mum also really enjoyed the duck lollipops which were wrapped in cucumber and served with rocket, radish and spring onions. The pate was rich and tasty and the salad garnish refreshing and crisp. Mum did feel that the portion was quite large for a starter, one of the lollipops would probably have been enough. 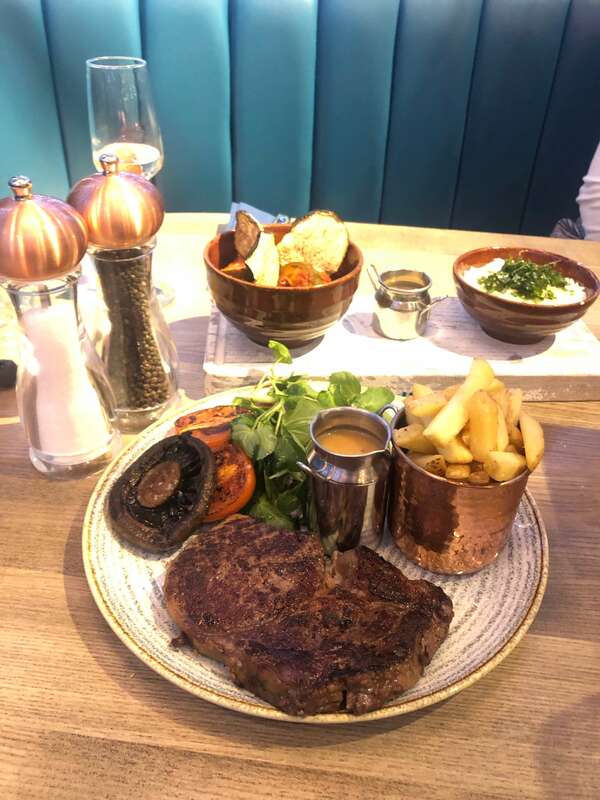 For our main courses I chose the vegetable tagine with baked rice and lemon tahini and mum went for the 10oz ribeye steak served with house fries, field mushrooms and grilled plum tomato. I’ve had tagine a couple of times during veganuary and this was by far and away the best one I’ve tasted. Others I’ve had have tended to be a little too bland whereas this one was full of flavour and packed with chunky Mediterranean vegetables which were really filling. The only thing that I wasn’t that keen on was the lemon tahini. Mum’s steak was perfectly cooked (medium rare) and beautifully pink on the inside which made this January vegan drool with envy. Apparently it was well seasoned and melt-in-your-mouth tender. 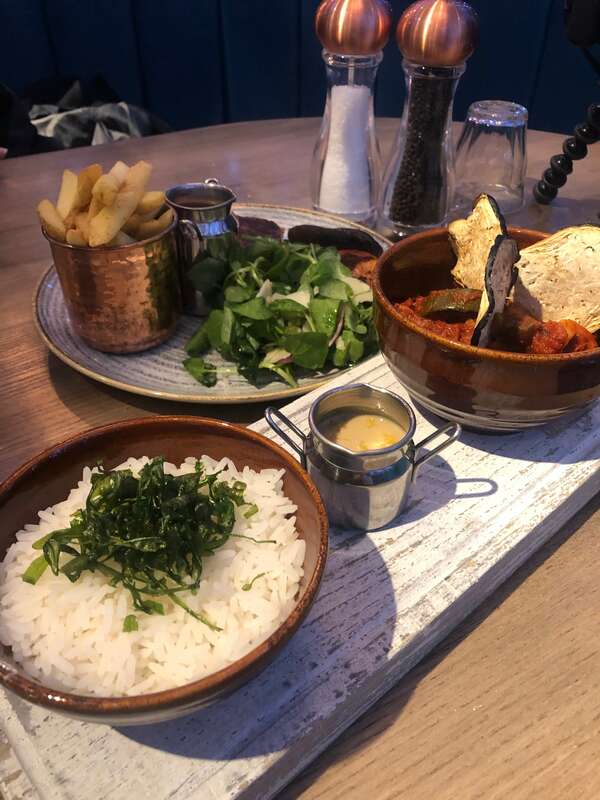 All of the food was really wonderfully presented which I think is really important – you eat with your eyes first after all! 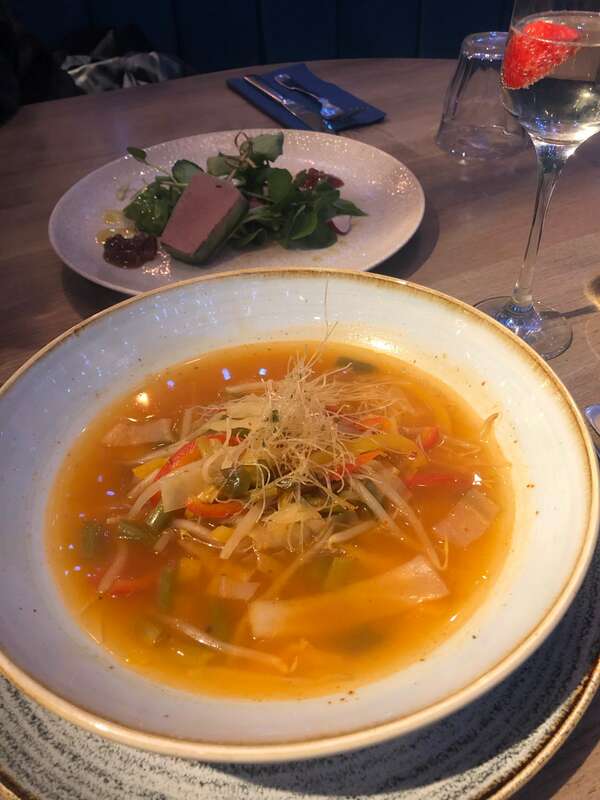 Overall I felt that the vegan options available on the menu were really good – there were quite a few different choices for the main course, rather than just the usually vegan-burger that you see on a lot of menus. This time we were too full to even attempt a pudding but I really liked the sound of the baked cookie dough and toffee cheesecake (next time – NOT in January!). I really shouted out the staff in my last review and this visit was no exception. 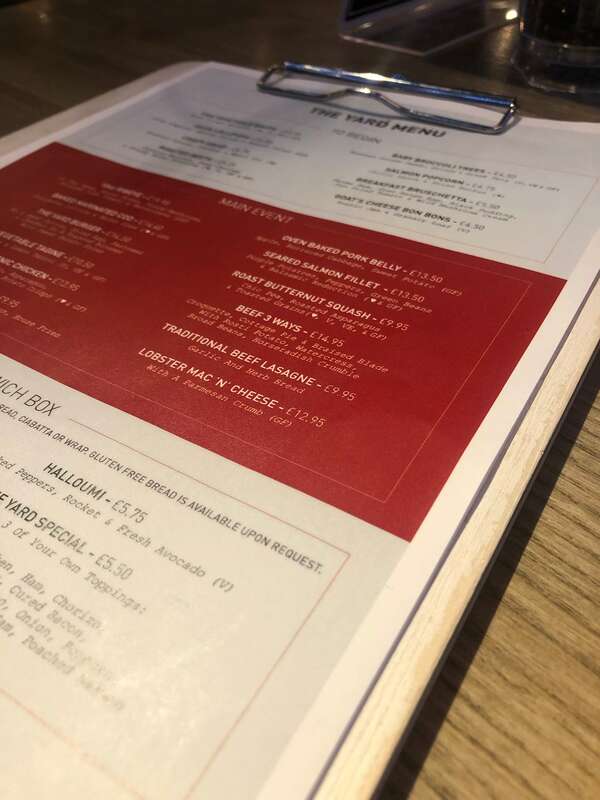 We were served by Toni, who was really lovely and chatty – he had a laugh and a joke with us and we quizzed him about whether Frank Lampard ever goes to The Yard. Nothing was too much trouble and he was really attentive, often checking whether we needed anything else. Once again, we really enjoyed our visit to The Yard in Derby and I can’t wait to go back again.